Previous posts [a, b, c] have described the development of the project. ODDT is a content aggregator for chemistry topics, such as rare/neglected diseases and precompetitive technology, which uses the real time news stream of Twitter as the source of its content. One of the two components is a back-end server that is in charge of monitoring the appearance of tweets with certain hash tags (#tuberculosis, #malaria, #hivaids, #huntingtons, #sanfilipposyndrome and #greenchemistry). These are collected, analysed and turned into factoids associated with the corresponding topic. The serverside code has been deemed robust enough to deploy it onto a server which is accessible from outside the development firewall. At the moment it is being hosted on the same hardware as powers http://molsync.com, which provides value added functionality for a number of mobile chemistry apps, but we have specific domain names: oddt.net, oddt.org and oddt.info, which will be migrated to new servers as demand requires. 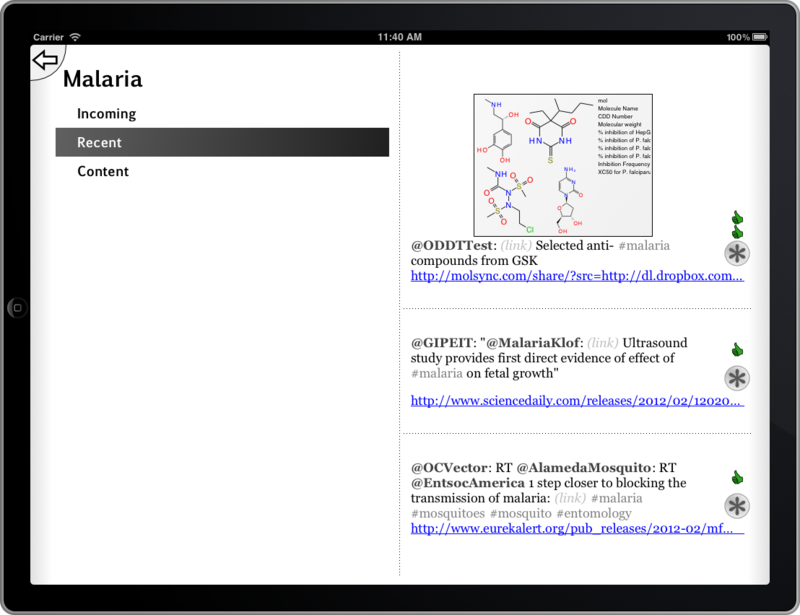 The front end app for iOS devices (iPhone, iPod and iPad) has gone through several preview stages: first a view-only interface for selecting topics then viewing a list of factoids; then, enhanced preview features for browsing links and viewing chemical data; then, integration with Twitter from inside the app, providing the ability to endorse content by emitting tweets that are subsequently harvested by the server and affect the placement of content. This is where we stand right now with the minimum viable product, which we consider to be ready for alpha testing. While we could just submit it to the AppStore now – and it is tempting – we would like to put it through intermediate levels of testing, by distributing the client individually, to people who are willing to try it out and provide feedback. So if this project looks like something that might interest you, and you can spare a bit of time over the next week or two, do please get in touch with either Sean or myself: leave a comment on either of our blogs, or send email to info – at – molmatinf.com.